CrowdSeekr.com, a company that helps investors connect with real estate crowdfunding investments, will be honored in Oklahoma City on August 11. Tim Strange, Marylee Strange, Ashley Smith and Chad Roberts. Oklahoma City-based real estate tech startup CrowdSeekr.com is pleased to announce that it is one of twenty-two Oklahoma companies to be honored this year by The Journal Record’s Innovator of the Year program. The Innovator of the Year class of 2016 includes companies representing many diverse industries, including pharmaceuticals, aerospace, automotive and mobile apps. An overall winner will be announced at the 19th annual Innovator of the Year event on August 11 in Oklahoma City. The keynote speaker will be Robin Smith of WeGoLook, the overall winner in 2015. CrowdSeekr.com is a leading aggregator and search engine for real estate crowdfunding investment opportunities. Real estate crowdfunding is a method for acquiring or financing real estate projects by connecting sponsors or developers with online investors who each contribute a relatively small amount in exchange for a percentage of ownership. Investors typically earn returns by sharing in appreciation and operating income of the projects. In 2014 alone, more than $1 billion was raised through real estate crowdfunding internationally, and the market is expected to keep growing, reaching $2.5 billion in 2015 and $3.6 billion in 2016. 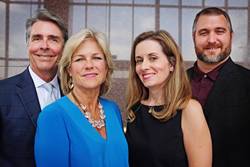 CrowdSeekr was founded in 2015 by e-commerce attorney Ashley Smith and commercial real estate professionals Tim Strange and Marylee Strange. VP of Technology Chad Roberts recently joined the team. It currently has listing partnerships with six real estate crowdfunding platforms.